Posted by V the K at 10:27 pm - June 20, 2017. 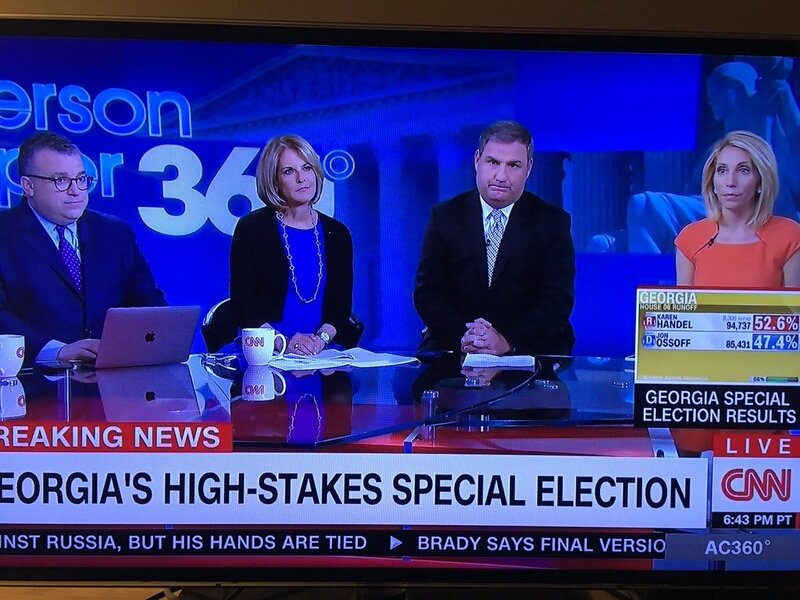 The CNN crew watches the results of the special election in Georgia’s 6th congressional district; where a defeat of a Republican by a Democrat with limitless funding in a purplish congressional district was supposed to signal the end of Donald Trump or something. Republicans picked up a win in South Carolina’s 5th CD as well. Both of them were won by Republican establishment types who will slavishly do the bidding of the financiers and donor class. So, forgive me for not getting too excited. Anyway, in Donald Trump’s Handmaid’s Tale America, Republicans have just sent another woman to congress. Sorry, narrative. It is kind of fun that wealthy Democrats blew something north of $30 million to lose this election. Probably closer to or greater than $40 million. 95% of Democrat Job “Pajama Boy” Ossoff’s funding came from outta state; mostly New York and California. I am just pondering the irony now that people in the throes of faux outrage about “Russian meddling” in American elections… spent millions of dollars and sent volunteers down to meddle in an election in a district none of them live in. Is that irony? Or is it just hypocrisy? Whew. I was afraid that Handel was going to jinx it, with her tacky pre-election boast. Considering the Republicans had too many weak candidates running in the primary, considering Handel’s terrible campaigning (and being a very unremarkable candidate), considering how Ossoff outspent her at least 5-1 and probably closer to 7-1, considering the national media were gunning for him, considering the district is trending bluer, Ossoff should have run away with it. The DNC made this special election a referendum on Trump. How ’bout them peaches? And don’t forget that Ossoff didn’t even live in the district he was running for. I am thinking of a Yiddish word that begins with p and ends with tz, but that might be blocked. I’ll join you in calling him a pajama boy. What gets me is that the tens of millions Democrats spent (even though their party is deeeply in debt already) was all based on emotion. “If we take this election, it will make Trump sad.” I don’t even think it would have made him sad. Right, but it would have been “pro-Trump Georgia district turns against him! Nation is ready for impeachment!” – so at least they would have been happy. Does it exalt dunderheads, cowards, trimmers, frauds, cads? Then the pain of seeing them go up is balanced and obliterated by the joy of seeing them come down. Is it inordinately wasteful, extravagant, dishonest? all alike are enemies to laborious and virtuous men. Is rascality at the very heart of it? Well, we have borne that rascality since 1776, and continue to survive. In the long run, it may turn out that rascality is necessary to human government, and even to civilization itself – that civilization, at bottom, is nothing but a colossal swindle. I report only that when the suckers are running well the spectacle is infinitely exhilarating. But I am, it may be, a somewhat malicious man: my sympathies, when it comes to suckers, tend to be coy. How any man can believe in democracy who feels for and with them, and is pained when they are debauched and made a show of. Left wingers are never hypocrites because they are perfect and know better than the rest of us. Case closed. Something must be done in reigning in these irredeemable deplorables and clingers. Make America Hate Again. Down with Trump. Up With Social Adjustments. But Trump is not the only unpopular politician in the country, and Republicans once again used House Minority Leader Nancy Pelosi as a bogeyman in a major House race, linking Ossoff to her in TV ads, in door-to-door conversations with voters and even in the televised debates between Ossoff and Handel. ” the republicans have just sent another woman to congress.” is that part of the ongoing republican war of women? I mean, it couldn’t possibly be that the DMC manipulates the polls to enthuse Democrats and demoralize Republicans, could it? That, and they don’t understand that while the politically active might be enthused, the less active will be complacent and not show up to vote. On a related note, one of the Clinton campaign’s stated strategies was not to advertise or campaign in Wisconsin because they were convinced voters there didn’t know there was a presidential election in November; if they realized that, they’d show up and vote Trump. Hard to believe the Clinton people were that stupid but it’s true. I’m still looking at that CNN sadfeels photo and no, it isn’t old yet.